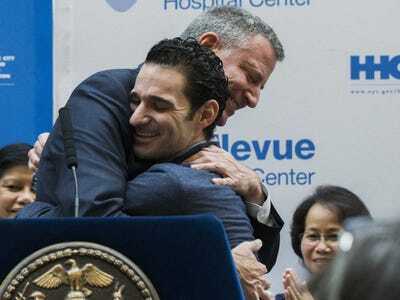 REUTERS/Lucas JacksonNew York Mayor Bill de Blasio hugs Dr. Craig Spencer as he is discharged from Bellevue Hospital, after being stricken by Ebola, in New York November 11. Mayor Bill de Blasio proclaimed New York City “free” of Ebola on Tuesday, holding a press conference with the recently recovered Dr. Craig Spencer — and giving him a robust hug to boot. “New York City’s first and only Ebola case successfully treated. Dr. Spencer is Ebola free and New York City is Ebola free,” de Blasio said at a press conference at Bellevue Hospital in New York. Spencer’s diagnosis last month set off a fluttering spate of worry in the city after reports emerged that he had ridden subways, had dinner, and gone bowling in the days before he developed symptoms. He had been treating Ebola-stricken patients in West Africa before returning to the US last month. New York and New Jersey moved quickly to institute mandatory quarantines on returning healthcare workers who had contact with Ebola patients in West Africa, even if they were symptom free. It was a policy New York Gov. Andrew Cuomo (D) slightly backed away from amid criticism. With Spencer’s recovery, there are currently no confirmed cases of Ebola in the US. “Today, I am no longer infectious,” Spencer said. “I am a living example” of how protocols for the disease work.